Sell them Individually, in Groups or Resell our Complete Package! new income from right away! Did you ever got bogged down with designing your Webpage? 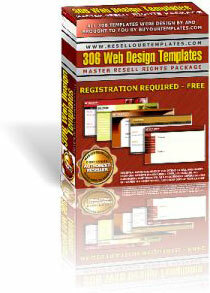 You will have instant access to over 300 template layouts and can begin utilizing them immediately. All you will need to do is add text to the graphic buttons and add text to the layout and you are ready to go. At this incredibly low price you have nothing to lose and best of all, you will receive complete Master Resell Rights to this package! Sell this incredible collection of templates any way you want! Use this incredible collection of 306 templates to create websites for your own products or services, or use them to create websites for others! Start your own template store! Since you'll own an instant stock of 306 different templates that you can sell individually! You can even resell these with resell rights! Which would mean that who ever buys these from you can resell the templates individually or as a package but cannot resell them with resell rights! If your a hosting company you could offer your customers access to your templates for free for hosting with you or you could charge them a fee per template! For a minimal investment you will own master resell rights to this entire package! Come up with your own ideas on how to market these. You could even sell these with master resell rights to your own customers which would entitle them to be able to resell these any way they'd like! Okay, So what do I get with this package? 306 Ready to use templates! in .zip format! All of the templates are fast loading templates! Complete Master Rights to the entire package!